The FTD Meditation Bouquet bursts with rich red color to convey your hearts sadness at the loss of the deceased. 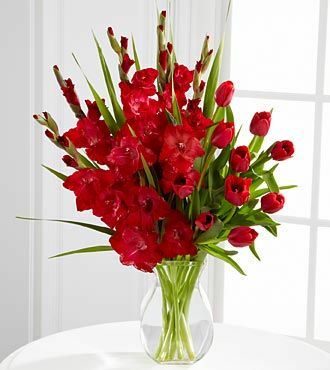 Ruby red tulips and gladiolus are accented with lush greens and seated in a classic clear glass vase to create a bouquet that honors a life that overflowed with love and beauty. Approximately 28H x 16W.